"Reality is a funny thing, you know... Reality is what you believe; believe it to be. It's what you put your thought and energy into, because your hands physically manifest thought. So your world becomes what you feel and what you think." "You have to realize: ok, I don't know how to solve a political problem, I don't know how to solve the pollution problem... all I know is in my own life, I need to figure out some sense of purpose, I need to figure out how to be happy... and I'm willing to give up looking at all you and trying to do everyone else's laundry and look at myself and what do I need... and that's profound. We point so many fingers and go 'this person isn't... are you blah blah blah?" If we all just took care of ourselves it'd be very efficient... all I can do ultimately in my own life... all I can speak is from my experience." Jewel, dressed "down" for a change, sang "Foolish Games" on Letterman on June 2nd, which included an interview segment! Elle MacPherson rounded out a smashing show. Look for "Foolish Games" on the Batman & Robin Soundtrack, out now. Hear a sample of the new version now! 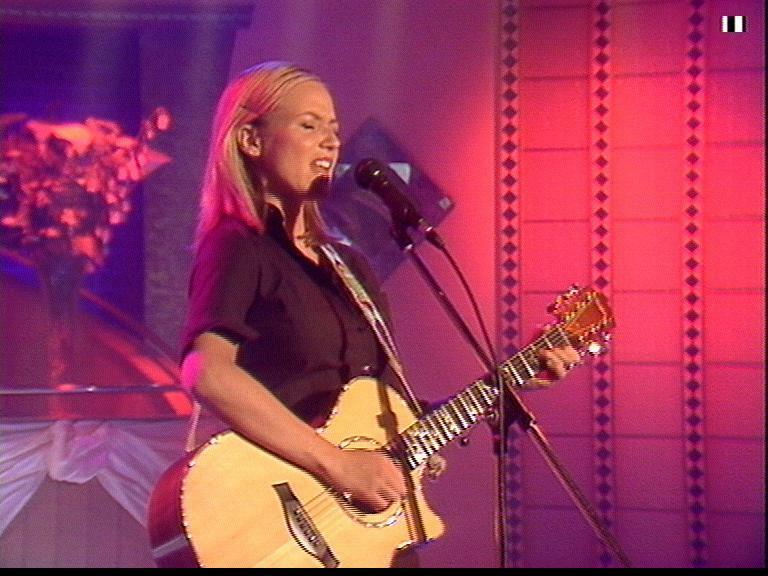 A "Best of Hard Rock Live" featured Jewel & Paula Cole on VH1 and repeats of her own one hour debut show. Jewel was the guest musical artist on NBC's Saturday Night Live on May 10th. She performed a jazzy "Who Will Save Your Soul" and "You Were Meant For Me." Euro-report: Jewel sings in London on "ITV's This Morning" on April 23rd. Thanks to Myles MacRae for this shot. The Rollingstone issue with Jewel was out and a big hit over all. If you missed it, just remember... there's always back issues from RS direct. Pieces of You is now quadruple platinum, selling over 4 million copies. There just may be a second Clueless soundtrack with "All By Myself" in the works. Jewel sang You Were Meant For Me on Nick's Kid's Choice Awards. Another pic here. Lilith Fair is the organization setup by Sarah Mclachlan. In addition to Sarah, the shows have a varying lineup of Apple, Autour de Lucie, Cardigans, Carpenter, Crow, Cherry, Cole, Colvin, Indigo Girls, Jewel, Loeb, Mann, Vega, Wild Colonials, Williams. Should be some great shows so check it out when it's in your area. � 1996-2006 Pieces of Jewel. All Rights Reserved. All content on this site remains the property of the original owner/broadcaster/publisher. To be used by permission.